Solid State Radiation Detector with LCD Complete! I added a PIC and LCD to my basic radiation detector and can now display total counts over time(up to 24 hours) or Counts/Sec and relative gamma strike energy level. The energy level varies as every gamma strike does not dislodge the maximum possible number of charge carriers. I take the maximum value registered every second and display. On average various materials indicate different levels, providing a crude detection signature. Besides the LCD display, this circuit has a sample and hold circuit which is connected to the PIC ADC module and also tied a another PIC I/O pin which switches from tristate to pulled low to reset the sample/hold circuit. The maximum sample rate is 13500 samples/per sec. Photodiodes convert light into current and this current can be coverted into voltage and amplified. Sounds simple right? Well, when trying to detect Gamma photons, the design of a photodiode detector is not so simple. This circuit is not paticularly complicated, but the design took some effort and many of the component values are critical. This circuit behaves like a classic Geiger counter, but unlike a traditional Geiger Counter you can actually measure the output pulses over time to roughly determine average energy of the gamma photons. With the addition of a microcontroller, an A/D converter and LCD – you can display all kinds of interesting data. Later, I plan to add this to my design. 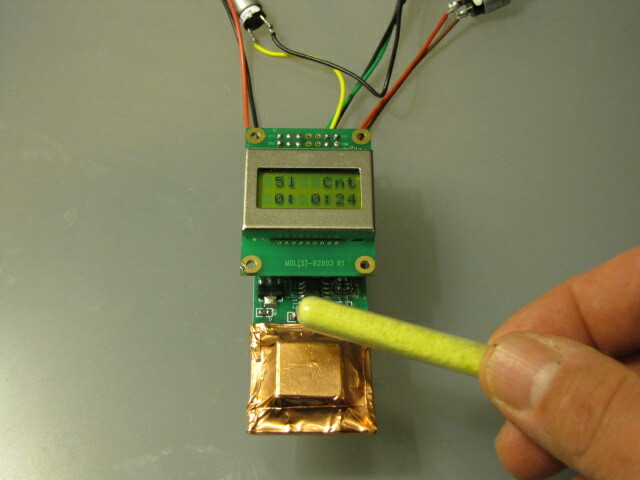 If you build this detector – you will need a source of radiation for testing. A cheap smoke detector can provide this (Americium-241) or import gas lantern mantles which have thorium in them. Check out ebay. When designing such a detector, the first issue to resolve is the selection of the photodiode. The important features are: the diode area, leakage current(dark current), and capacitance.You want the capacitance to be low as possible, the diode area large as possible and the reverse bias leakage current as small as possible. Unfortunately, the larger the diode area, the worse the leakage and capacitance become. A large diode is desirable to provide more area for photons to strike. Gamma photons create a transient current charge on the photodiode, so if the capacitance is to large, the photon strike transient is absorbed and not detected. By reverse biasing the photodiode, the depletion region is increased and the capacitance is significantly reduced. The reverse biased mode of operation is called photo-conductive mode. However, the reverse bias creates leakage current which generates noise. The gamma photons produce very small charges and the output is very close to the noise floor; so care must be taken to minimise all noise. Having said this, reducing capacitance appears to be more beneficial than the noise of the dark current is detrimental. This is because you need the frequency response to capture the transient of a gamma photon event. Using the highest bias possible is generally preferable. Not only do the gamma strikes produce higher output, but the stability of the amplifier circuit is improved allowing for more charge gain. The photodiode I am using is very large. 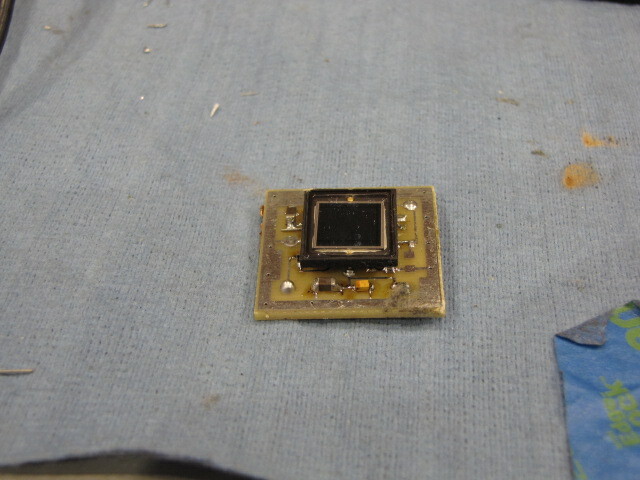 It is 10mm x 10mm and has 80 pF of capacitance under bias and about 2-4 nA of leakage current. It is the PS100-7-CER-PIN the performance is excellent but it is very expensive. A much lower cost alternative photodiode is the BPW34. However, it is less than 1/10 the area and will require closer proximity to obtain photon strikes. On the bright side, its capacitance is much lower. The first stage of amplification for the photodiode is a transimpedance amplifier. Which is a current to voltage amplifier. The impedance of the photodiode is incredibly high requiring an OP amp with input bias currents of picoamps or less (minimizes loading of the photodiode) and bandwidth greater than 1Mhz as the photon strikes generate pulses from 100KHZ to 50Khz or so. The noise figure of the op amp needs to be very low. Also the OP amp should have low input capacitance so as not to create further high frequency loss. The OP amp I chose was the LMP7721 which has a bandwidth of 17 mHz, an input bias current of 3 femtoamps(amazing) and an input capacitance of about 8pF. Other amplifiers will work. Another good choice is the LM6211 which has even less input capacitance and picoamp bias current. Both of these amps have very good current and voltage noise figure specs. Ccomp = 1+sqrt(1+4Pi*Rf*Cin*unity gain bandwidth)/(2Pi*Rf*unity gain bandwidth). In my case, the Cin is 80pF, unity gain freg is 17Mhz and Rf 47Meg. When you do the calculation you will end up with .2 pF which is so tiny, it is not practical. To solve this, I use the resistor network formed by R5 and R6 to allow for the use of larger value capacitors. As long as the resistors R5 and R6 are much smaller than Rf, the effective capacitor value is reduced by the resistor ratio. The value of the compensation capacitor is critical. If it is to large gain is reduced and of course if it is to small, the amplifier will be unstable. The second amplifier stage is the first stage of a LM358. It has a low frequency roll off at about 20 Khz to eliminate 60Hz hum and other low frequency noise. This is acomplished by the first order filter formed by C9 and R13. The second stage of the LM358 is a comparator with capacitor C12 added to beef up the pulses for better flashes and or clicks from a small speaker or piezo transducer. As shown in the schematic, the photodiode and first stage of amplification, need to be shielded with foil to eliminate light and electrical noise. Because of this, it can only detect gamma rays or cosmic radiation , which is super charged alpha particles. In this case Cf is .5pF (.22pF + stray) and Rf is R4(49meg). The R feedback value is large so that it does not load down the photodiode but still provides feedback such that voltage at the input node stays at zero and the charge is forced onto the capacitor Cf by the feedback amplifier. It is not large to set gain in the traditional sense. If you look at this circuit as just a simple inverting amplifier, my point is easier to understand. For voltage gain, the (feedback resistor/ source impedance) would be the voltage gain of this inverting OP Amp topology. Here, the photodiode source impedance can be 100 megaohms up to gigaohms. So a feedRf of 10 meg or 47 meg doesn’t make much difference. The transformation of charge to voltage is often refered to as sensitivity rather than gain. The units would be mV/MeV (millivolts per mega electronvolts). This is a unsual amplifier in that we are trying to convert a discrete number of collected electrons into a voltage pulse. A different way to think of this circuit is as a charge amplifier, where a gamma photon strike creates pool of electrons on the photodiode. From this, we can derive Gamma sensitivity. To do this, we need to know the energy of a gamma photon, the energy required for silicon to break an electron/hole pair (temp sensitive and approximately 3.62 eV at room temp), our feedback capacitance in the amplifier(about .5pF) and the elementary charge of an electron(1.6×10^-19). To start with: Voltage = Q/C where Q = number of electrons (charge) and C is the Cf in our circuit. Vout(amplifier) = Qin/Cf(which is effectively integrating all of the charge to voltage at the output). For example: Americium-241 generates a 59Kev gamma pulse, therefore 59Kev/3.62eV = number of electrons = 16.3K electrons per gamma strike. This assumes all of the possible electrons and holes are formed , which is an ideal assumption and not realized. In my circuit, I amplify this output 100 X so I would expect to see an output of .5v . This is an ideal result and does not take into account stray capacitance, limited amplifier open loop gain, filter losses, and imperfect conversion of electrons in the diode, etc. When I am lucky I see about 200 mV output from an Americium-241 source. On average, an Americium-241 source will generate a 150mV pulse. When this circuit is working correctly, there will be about 50mV to 60mV of noise. The practical detection threshold is about 100 mV.